Sears Craftsman may by the best known lawn mower brand in the USA. Thanks to the numerous Sears stores throughout the country, as well as a decades-long history of providing American shoppers with their needs, Sears has become a legend. In recent years, Sears Craftsman lawn mowers have been directed to the entry level lawn mower market. This means you will not find a great deal of “higher end’ models in the lineup. No models are offered with a blade clutch system, for instance, and most of the mowers are equipped with side valve Briggs and Stratton engines. If you are looking for an inexpensive mower that will get the job done, Craftsman may be the mower for you. All of the Craftsman mowers have stamped steel decks. This reduces both weight and cost. The majority of the mowers offered through Sears are ‘3 in 1’ in design, meaning the operator has the option of bagging the grass from the rear, using a side discharge, or mulching the grass. Prices start at about $200.00, with a basic walk behind mower without a self propel system. The most expensive Sears mowers may run $400.00. Watch for Summer sales. 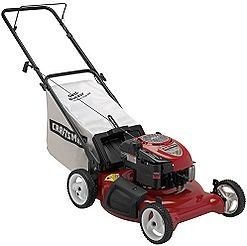 The least expensive Craftsman mower model is a side discharge only - all other models have the ‘3 in 1’ designed deck. A basic Briggs and Stratton engine using a foam air filter powers this mower. The engine is proven in design, since it has been around for decades with little change other than an updated carburetor that performs better in the heat, and stylish engine shrouds. The engine provides less power and fuel economy compared to the more modern engines. If you are willing to spend more, a self propel option is available. Craftsman mowers may sport either a front wheel drive or rear wheel drive configuration. In the front wheel drive model, the speed is constant, and cannot be adjusted. It is equipped with a Honda OHV ( overhead valve) engine. The rear wheel drive version is equipped with a Platinum Briggs and Stratton engine ( side valve), and is variable speed. Count on spending close to $400.00 for either of the self propelled models.